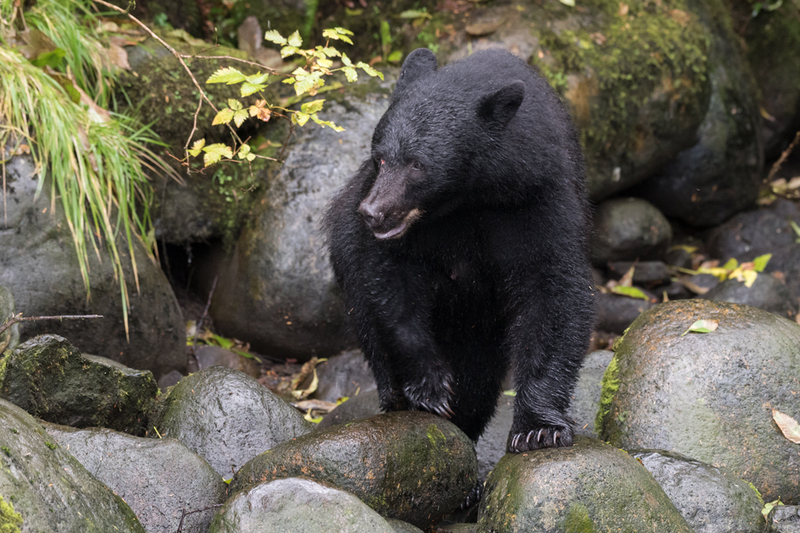 The big old male black bear. 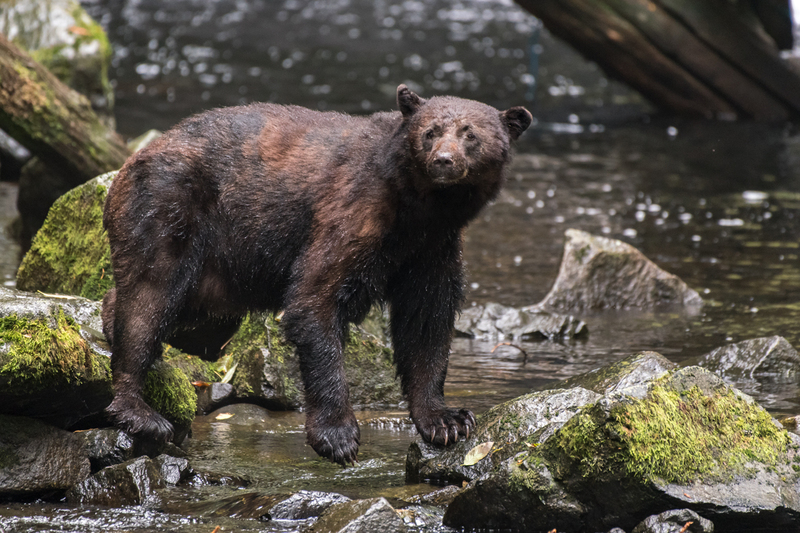 This morning I returned to Thornton Creek Fishery and spent as much time as I could photographing an old male black bear and a little female with two cubs. I wish I had had much more time here. I shall return. I fell in love with these bears. 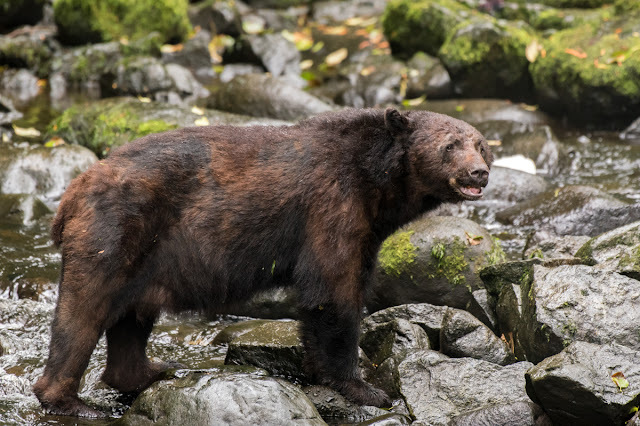 When I first got there the old male, who in coloration is a mottled brown and cinnamon, was basically taking a nap in the underbrush on the river bank. 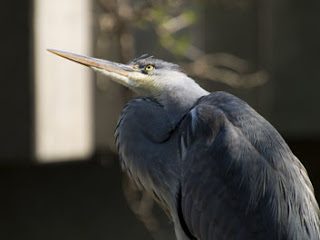 He would occasionally lift his head to check out the fish situation in the river but otherwise wasn't doing much but lazing about. 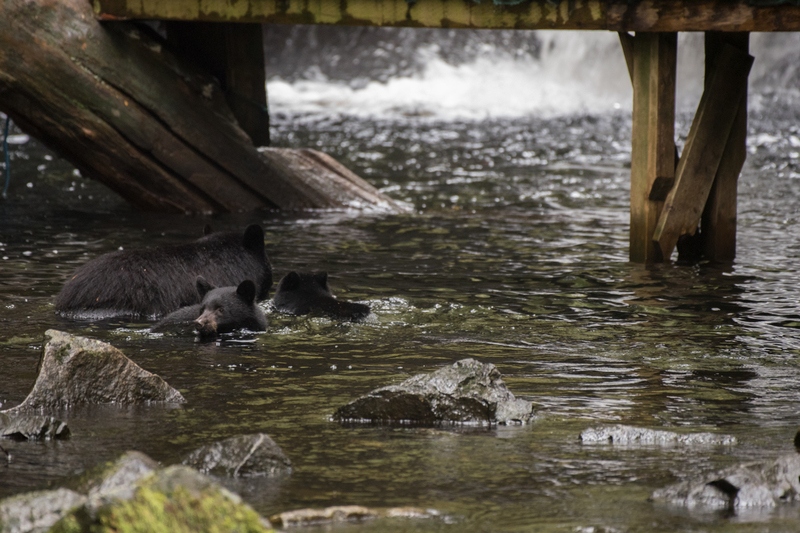 There is a waterfall farther down the river and occasionally you could see a salmon jump but the old black bear wasn't interested in that. Perhaps he was already full and was just devoting all his energy to digesting his meal. He eventually moved into the middle of the river, ever so slowly, and went up into the woods. Just resting among the ferns. The big male finally on the move. What amazing coloring he has. 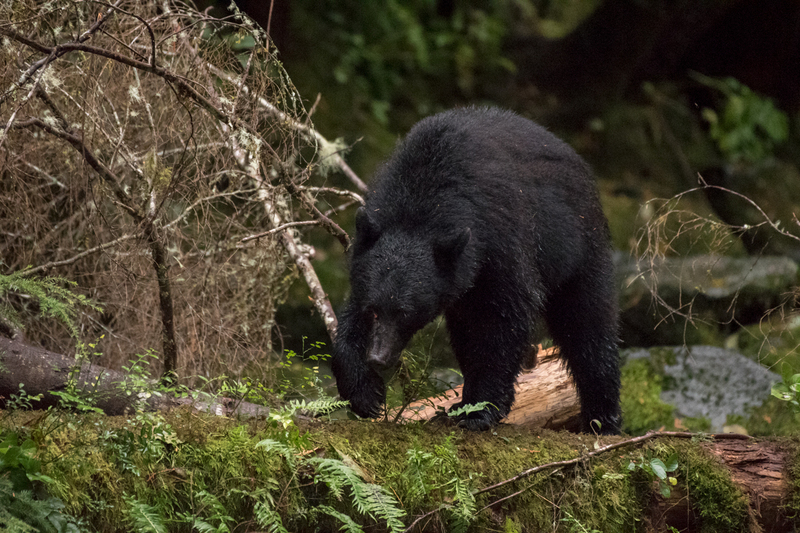 As soon as the old male left, out darted the little female black bear. She is recognizable by a bad scar on her face. Out she ran and right behind her followed her two cubs. She went right for the deep water near the waterfall where the salmon jumped. She entered the deep water, the cubs scrambled all over her. 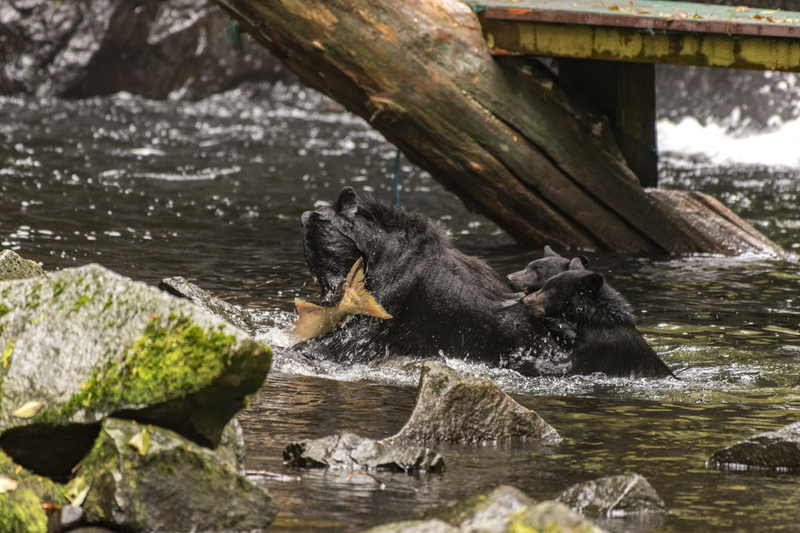 It looked like they were playing but then suddenly her head ducked under water and up she pulled a salmon half her size. 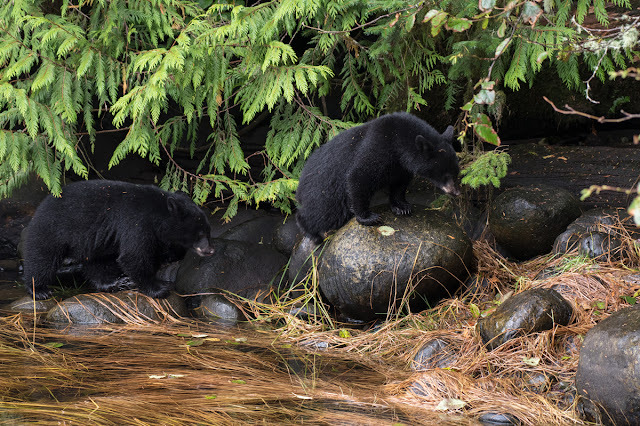 In one amazing motion she was out of the water, cubs clinging to her, salmon locked in her jaws, and up the embankment she went into the woods. I could see occasional movement as the cubs got ahold of the fish but otherwise they were hidden in the thick forest. Mama bear. You can see just a hint of the scar on the right side of her face near her eye. Making their way up the river. Into the deep pool they go. You can see the waterfall in the background. Still paddling around the deep end. 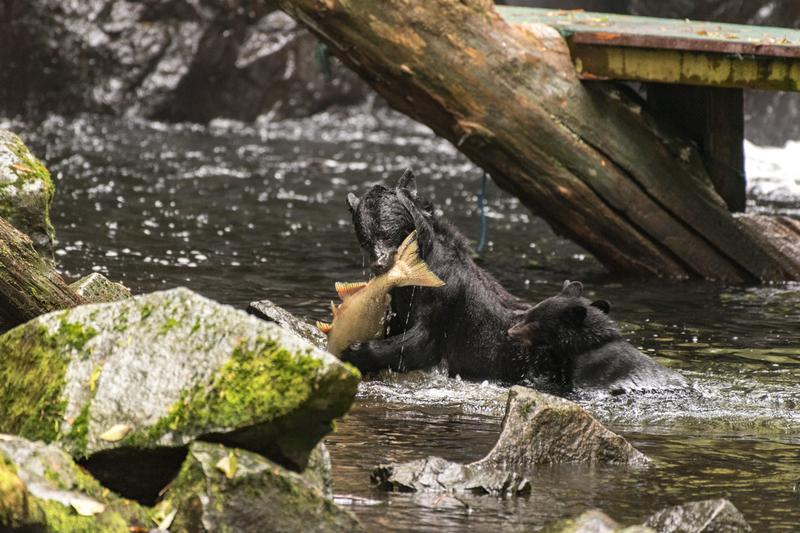 And then suddenly mama bear surges out of the water with a huge fish! That is one big fish. Then the old male appeared again. He was peeing on the side of the river when mama bear came flying down the river bank to confront him and warn him off her cubs and their meal. He hadn't even made a move in their direction. 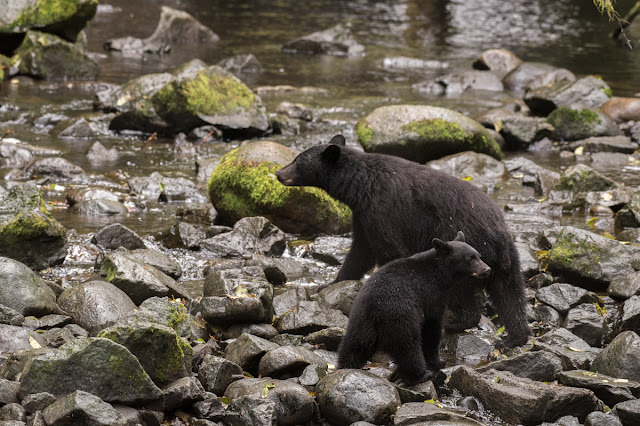 But he got a good telling off from mama bear, who was less than half his size. His only reaction was to look completely chagrined. I mean he was in the middle of peeing after all and suddenly he was confronted by a whirling black ball of serious attitude. Of course things could have gone much differently. Thankfully, they didn't. The old male slowly made his way into the river. 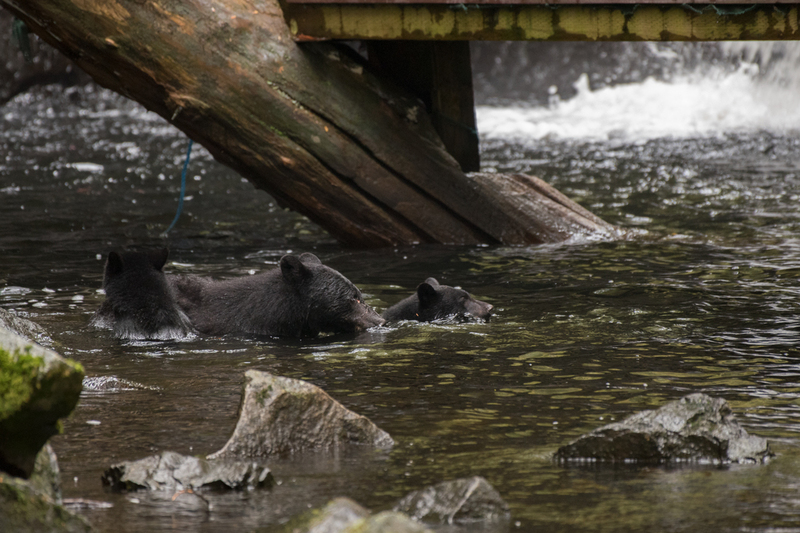 He took a leisurely dip in the deep pool and then made his way to the opposite side of the river and up into the woods. That was my last sight of him. 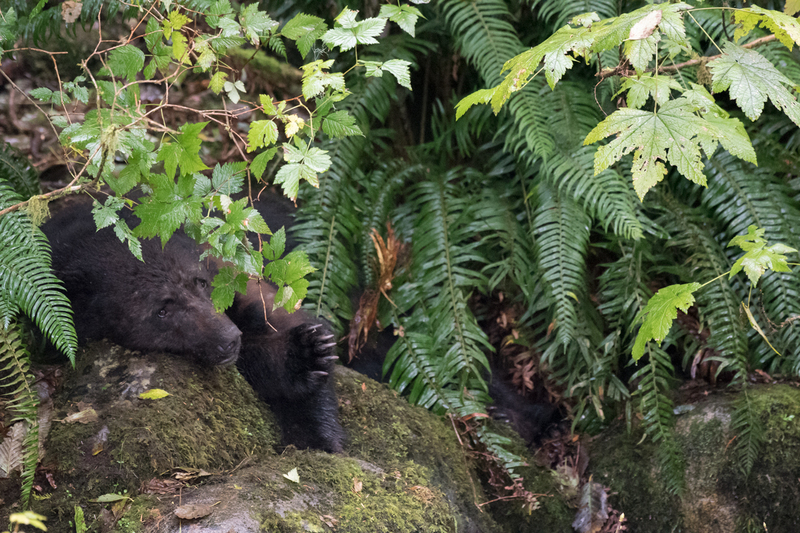 I briefly saw mama bear again as she scaled a log and then went into the underbrush, probably leading her cubs back down the river to the shore. One last look at fierce mama bear.